In a professional kitchen, your canopy draws away all the grease, fumes and hot air, making it safe and comfortable for staff, and completely whiff-free for customers. But while day-to-day cleaning might remove the top layer of grime from the canopy and filter, only deep cleaning will blast off stubborn grease and fatty deposits. We do this regularly for pubs, restaurants, hotels and care homes right across Yorkshire. 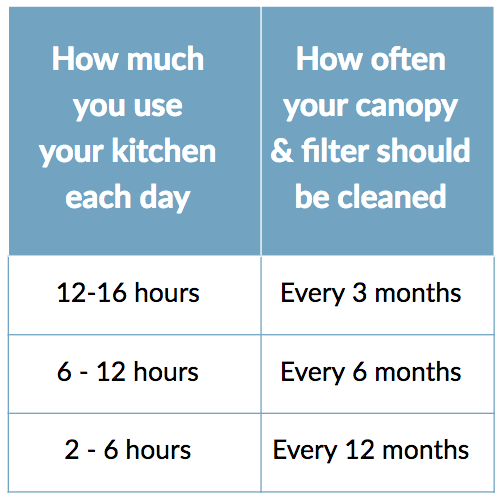 How often should you clean your kitchen canopy and filter? The Building and Engineering Services Association (BESA) set the standard for commercial ventilation hygiene. Their guidelines - known as the TR19 regulations – say that it’s your responsibility to keep your extraction system spotless. Our experienced team follows TR19 by the letter, ridding your canopy and plenum chamber from deep-set grease and grime using a custom-made foam? ?, before soaking and scrubbing your filters or replacing damaged ones. Less bacteria – congealed grease and fat are a breeding ground for germs, so removing it makes your kitchen a more hygienic place. This reduces the chance of food contamination and keeps the Environmental Health Agency off your back. Lower fire risk – greasy deposits catch fire easily, and research shows a deep-cleaned canopy and filter reduces the potential impact of any fire. It also gives you a documented cleaning plan to show insurance companies if the worst happens. Insurance compliant – most buildings insurance policies have ‘maintenance’ requirements and many have a ‘Fryers Warranty’ that stresses the importance of keeping your grease extraction system clean. Increased lifecycle – it might seem obvious, but a cleaner ventilation system is less likely to deteriorate over time, so you’ll save money in the long term. Better performance – dirty canopies and clogged-up filters are less likely to do their job properly, so we’ll make sure your kitchen stays well ventilated. With us, you don’t just get a team of emotionless ‘cleaning operatives’, but friendly, trustworthy people with a proud 30-year track record of cleaning every kitchen like it was their own. Our skilled and experienced staff use the same specialist cleaning equipment as the big firms, and we’ll even pull a night shift if you need to be open the next day. Read more about us.